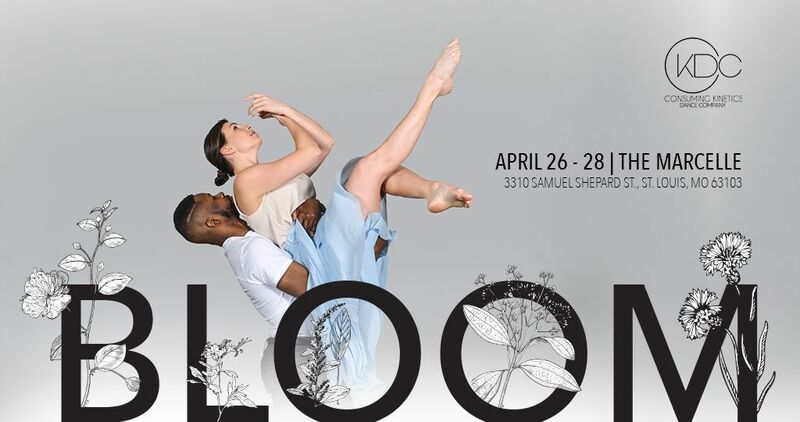 CKDC's Spring Concert, Bloom, celebrates a new beginning for the company as they continue their journey in their new home, in the Central West End. The concert will explore ideas of starting anew, flowering, developing, and growing. In addition to blooming in the community, the concert is also the first ever to offer choreographic positions to three Junior Company dancers age 11 - 13 in celebration of their unique growth as young artists. These two talented students, Katrin Allen andMoxie Doctor are joined by their mentors and Resident Choreographers Arica Brown, Ashreale McDowell, Kat Norton and Mel McCray as well as Guest Choreographers Mary Clermont and Rafael Tillery to bring efflorescent themes to the stage this Spring. Bloom is made possible thanks to the generous support of the Kranzberg Arts Foundation where Consuming Kinetics Dance Company is proud to be a resident company. The Marcelle box office opens 1 hour prior to show.